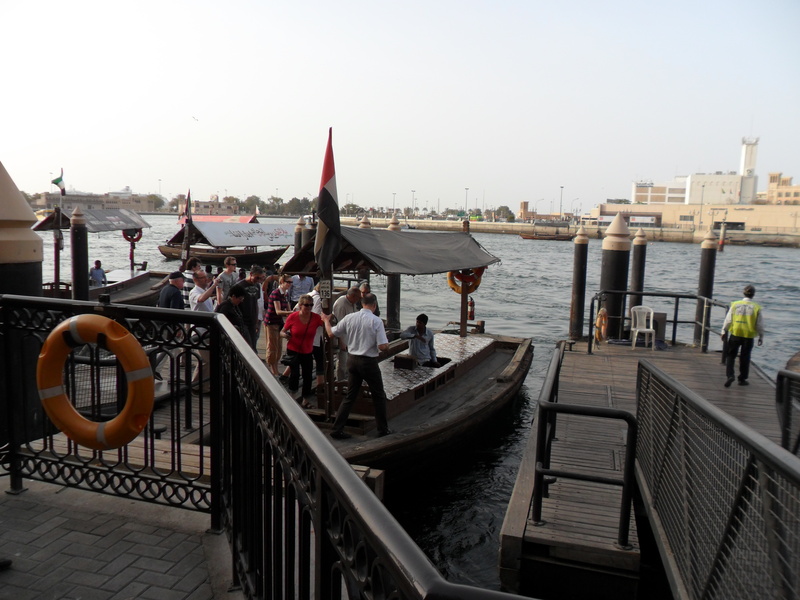 New Year’s Eve began with a drive to Dubai and lunch at the Special Ostadi restaurant. 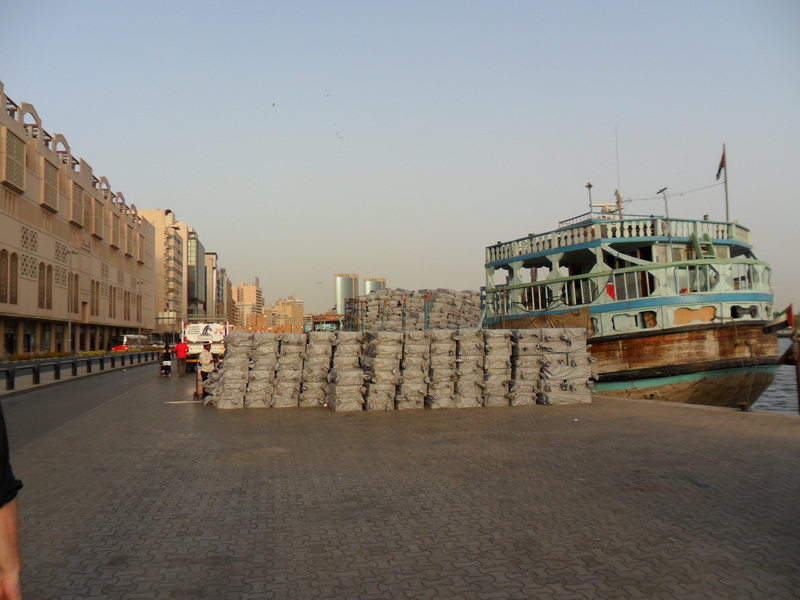 Then we went down to the Bur Dubai side of Dubai Creek. We walked through the old souk (market). The merchants were calling out to DaddyBird calling him “boss” and to BabyBird calling her “Shakira” to entice them to stop and see the wares. 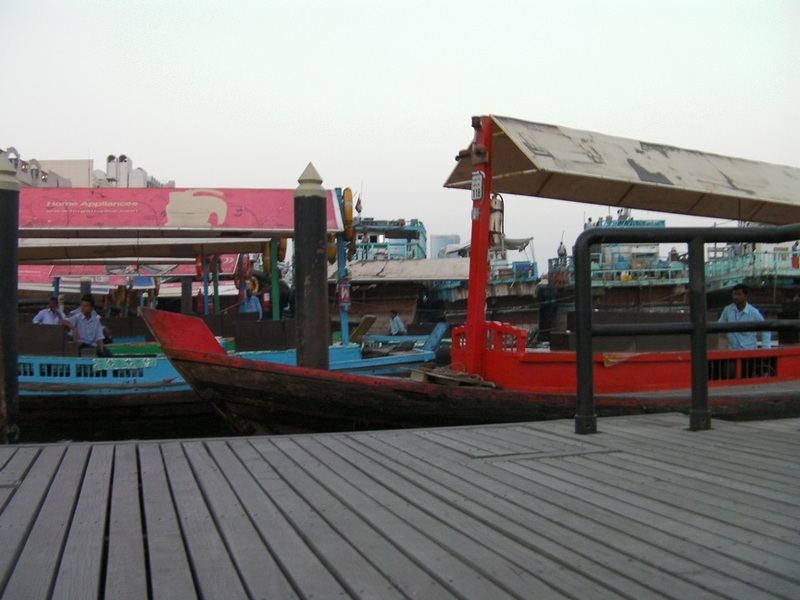 From there, we took an abra (water taxi) across the creek to the Spice Souk area. The ride across the creek is always pleasant and it is much cooler on the water. 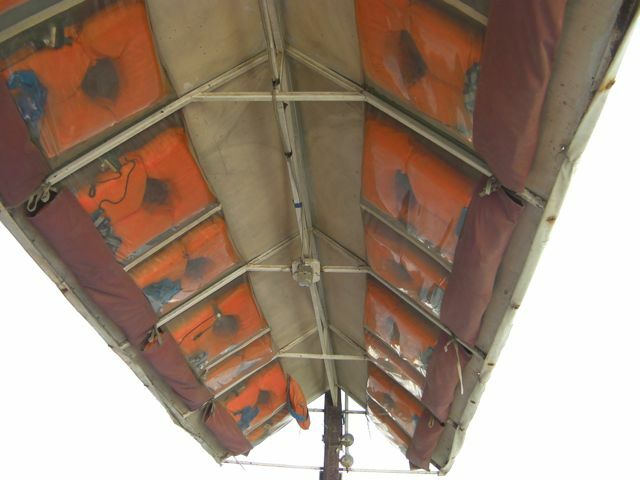 I haven’t even thought of looking up while on the boat before and was surprised to see the life jackets. If the boat runs into trouble, I doubt I would have time to get one of those, but the thought is nice, I suppose. We stopped for fresh juice and BabyBird discovered that fresh apple juice is not like bottled apple juice. I had watermelon juice and was unpleasantly surprised to find that the seeds had been included. 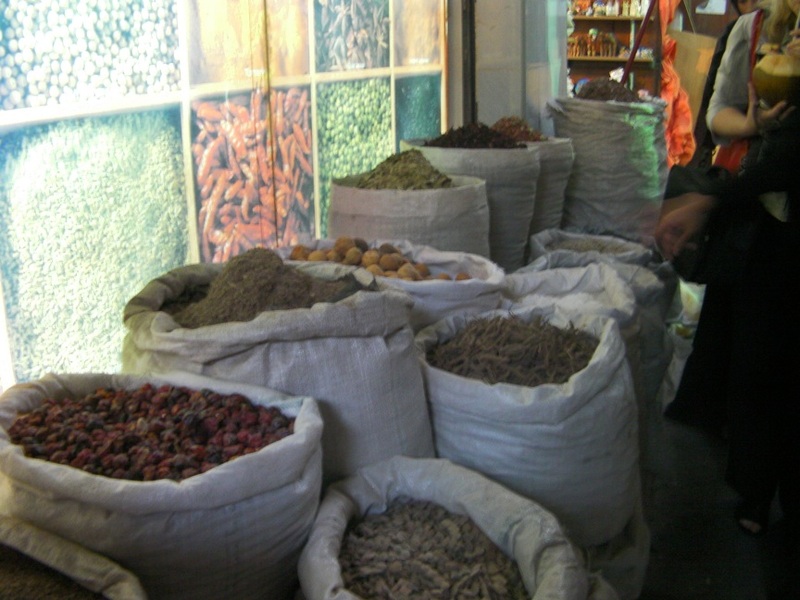 We walked through the Spice Souk and Gold Souk. 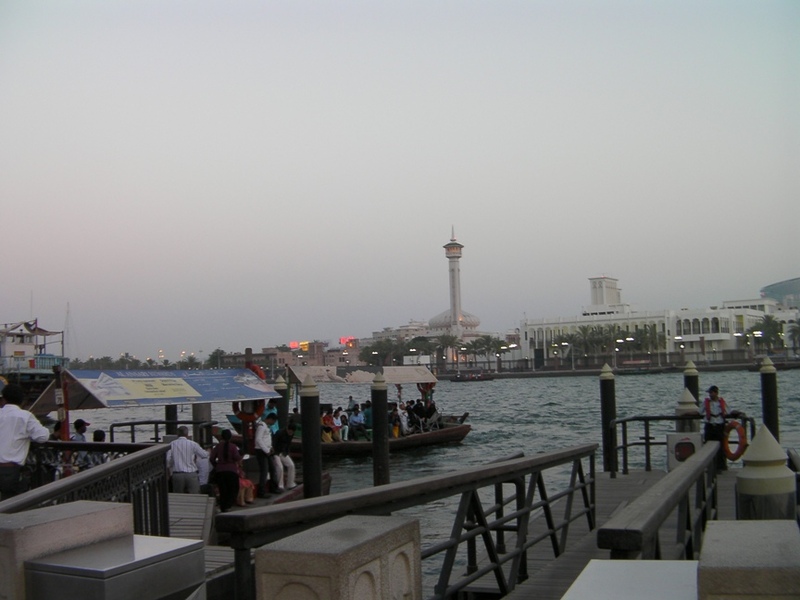 To return to the car parked in Bur Dubai, we took the metro train. 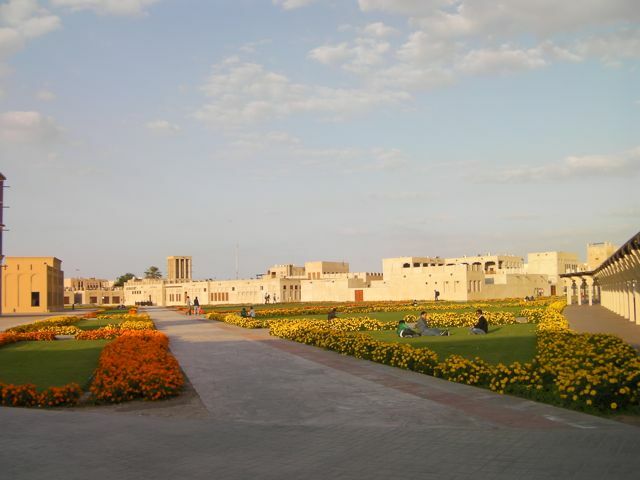 The park area near the Shindaga historical area is quite nice and inviting to those who want to relax for a while. 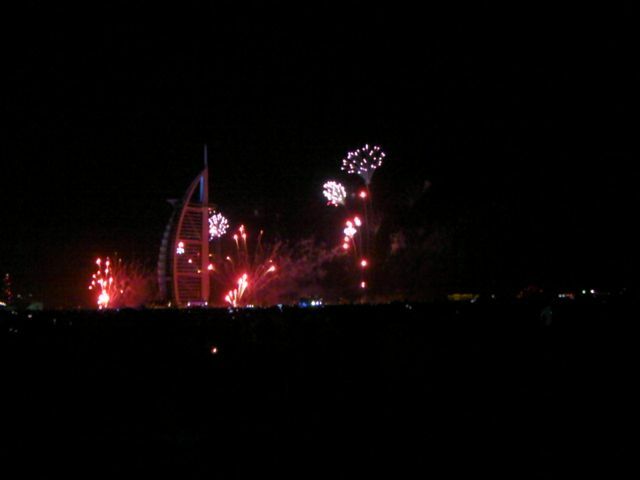 Next, we were off to Bu Qtair Restaurant for our traditional fish and shrimp dinner with friends followed by fireworks seen from Jumeirah beach. 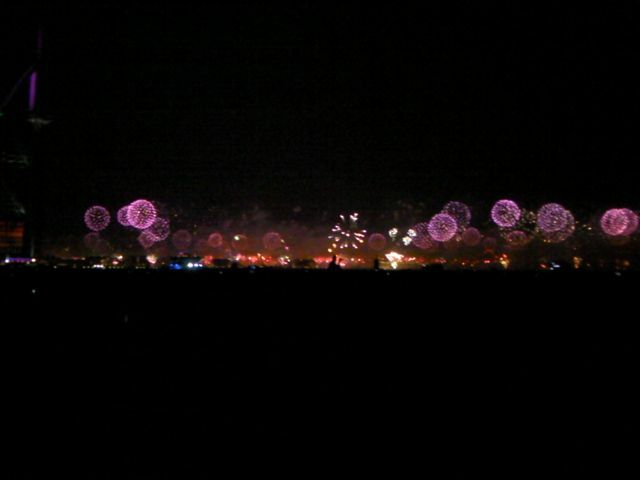 This year, the world record breaking display capped the evening shooting off from the Palm Jumeirah island and the World islands. It took 2 hours to get out of Dubai and another hour to drive to Fujairah, but it was worth it. 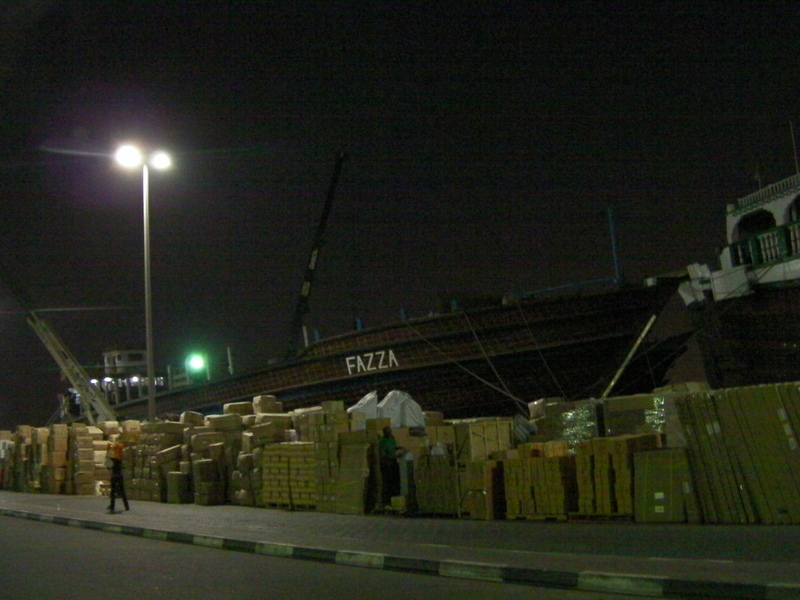 Some very large dhows on Dubai Creek. I’m on two weeks vacation now, but we are staying local. 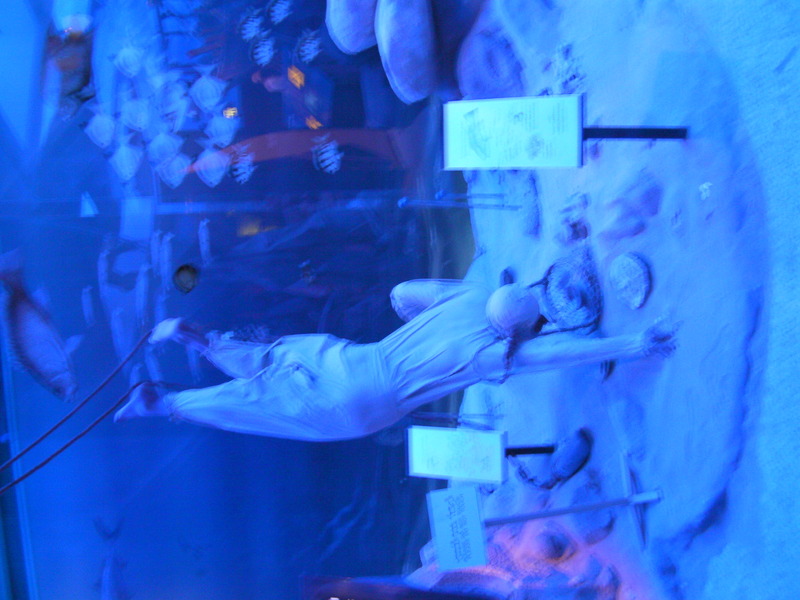 We needed to go into Dubai to do some bank business at our original brach, which only took a few minutes, so we had the rest of the day to be tourists. 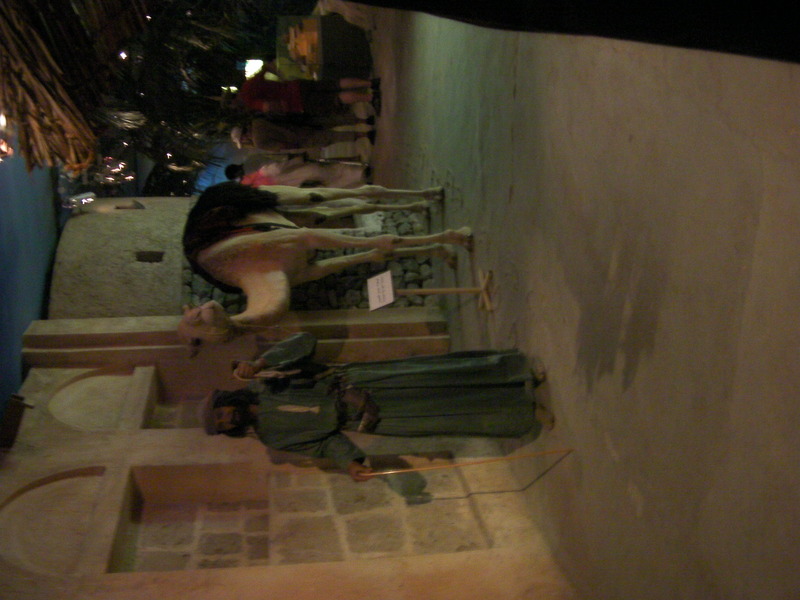 So, we went to the Dubai Museum, which is in Bur Dubai, the oldest part of town. 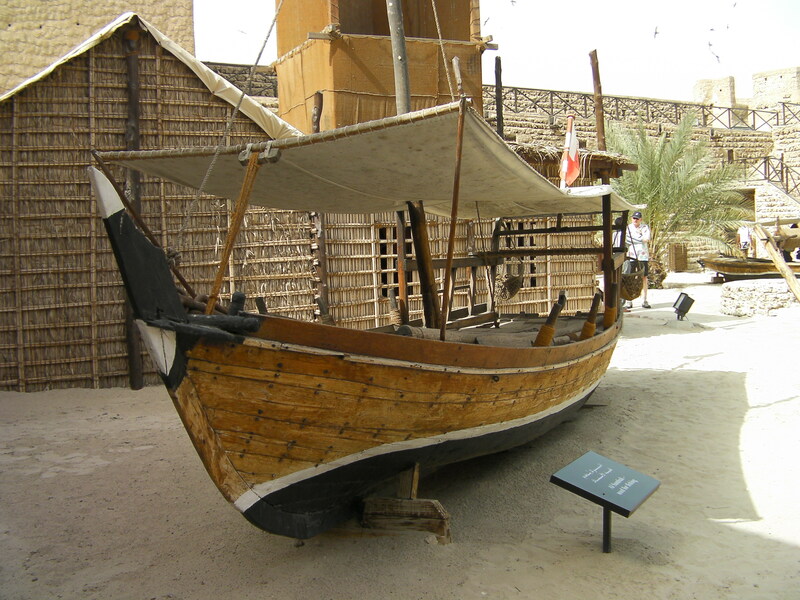 It is housed in Al Fahidi Fort. Admission is 3 AED ($0.81). 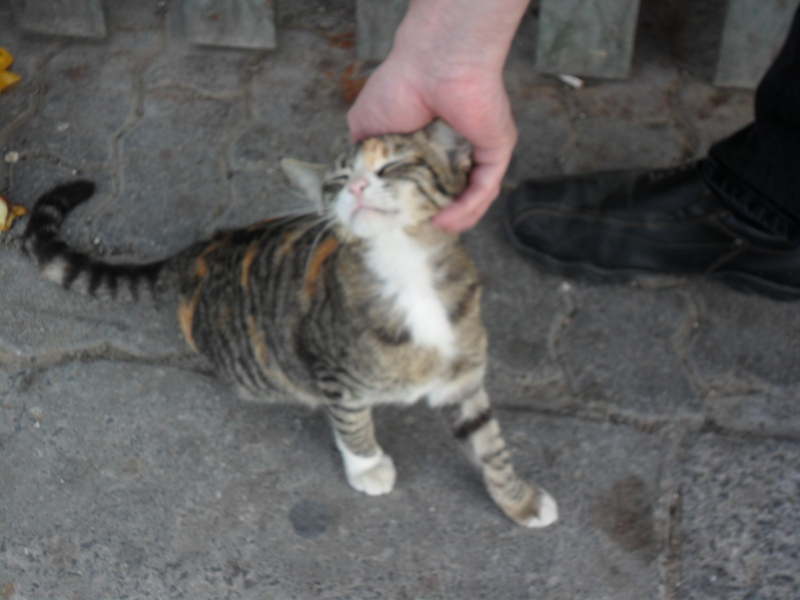 We headed over to the Dubai Creek where we met this lovely stray cat. She enjoyed some getting some attention. 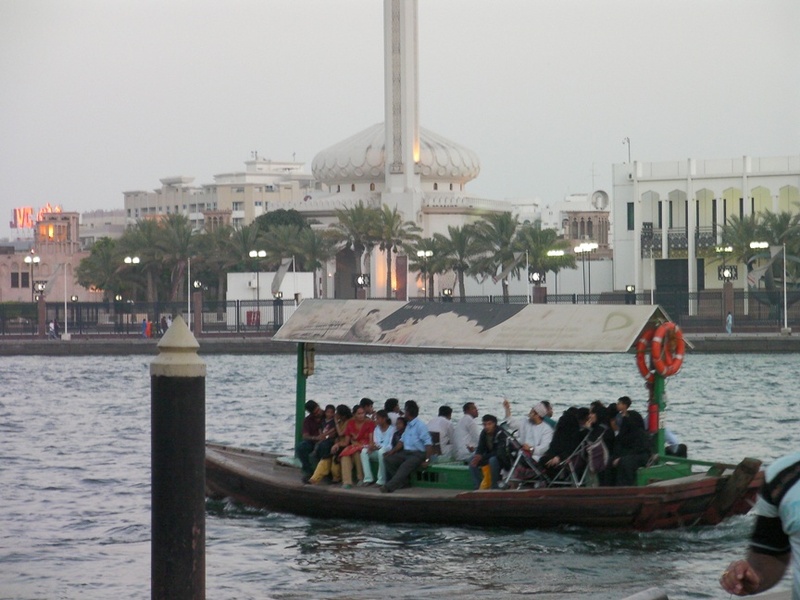 We took an abra across the Creek to the Deira side. The price is still 1 AED each ($0.27) There was a parade of tourist buses unloading travelers transferring to the abras. Then we took a walk down the creekside where boats load cargo. We did this same walk about three and a half years ago. There was significantly less cargo, but that may or may not be a sign of anything. We road back across the Creek on another abra. 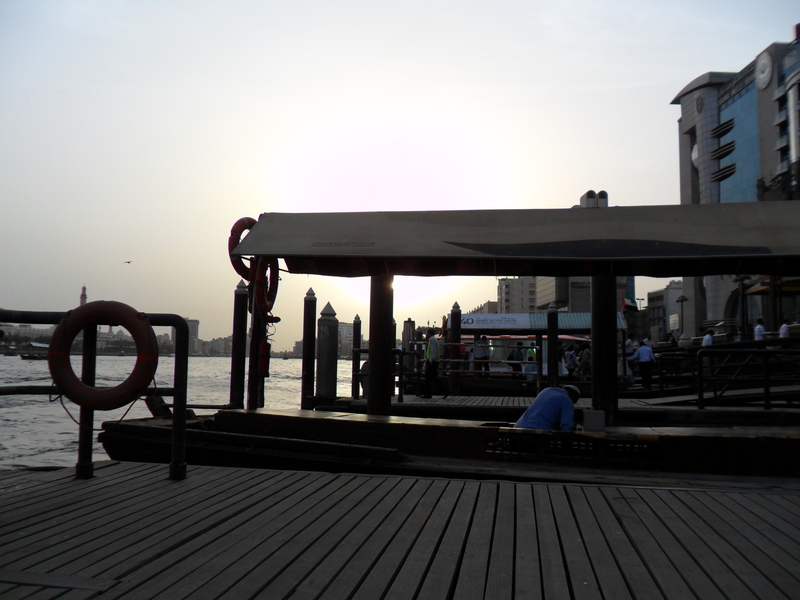 We ate dinner at Bayt Al Wakeel restaurant which has a wooden deck that hangs out over the Creek. It is a nice view, but I cannot recommend the restaurant. The service was not particularly good. The bread was not freshly baked. The meat (both chicken and lamb) was tough. And, worst of all, they chased away the stray cat. All in all, it was a pleasant day. To see all pictures from the day – click here. Some things have changed greatly, other things remain much the same. Last Monday evening we went on a tour of Dubai that was organized and conducted by some of the college students for the “newbie” staff. Not all the newbies opted to go, so there were openings for others and we jumped at the chance. Our first stop was along the Creek. A crowd of 14 Emirati women and about that many staff members drew a bit of attention. 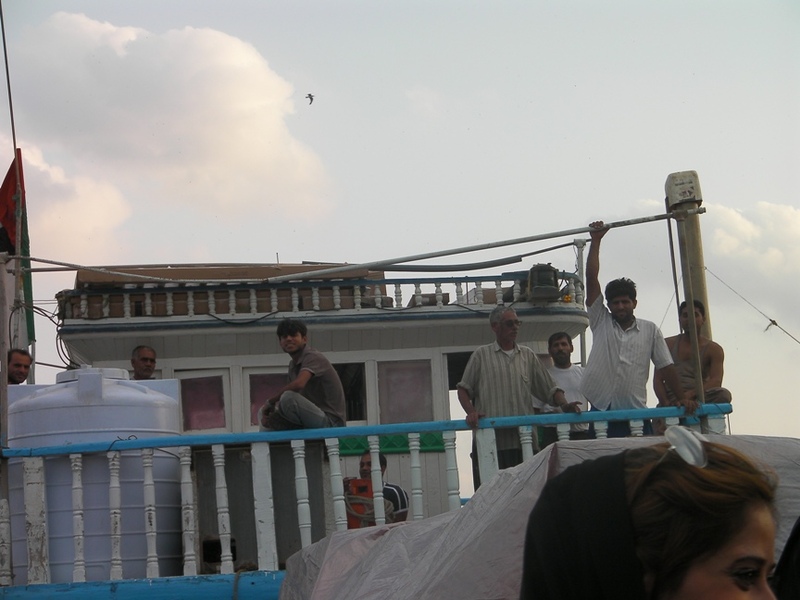 These boatmen were staring at us, so I figured I could take a picture of them. So there! 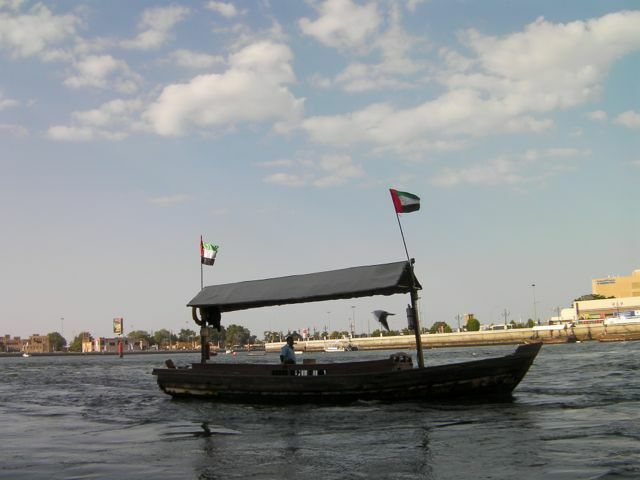 As promised here is the video of the abra ride across Dubai Creek from Deira to Bur Dubai. The boat pulls out a short distance, then pulls back in again because the driver decided that he needed two more passengers. Once two more men got on, away we go. 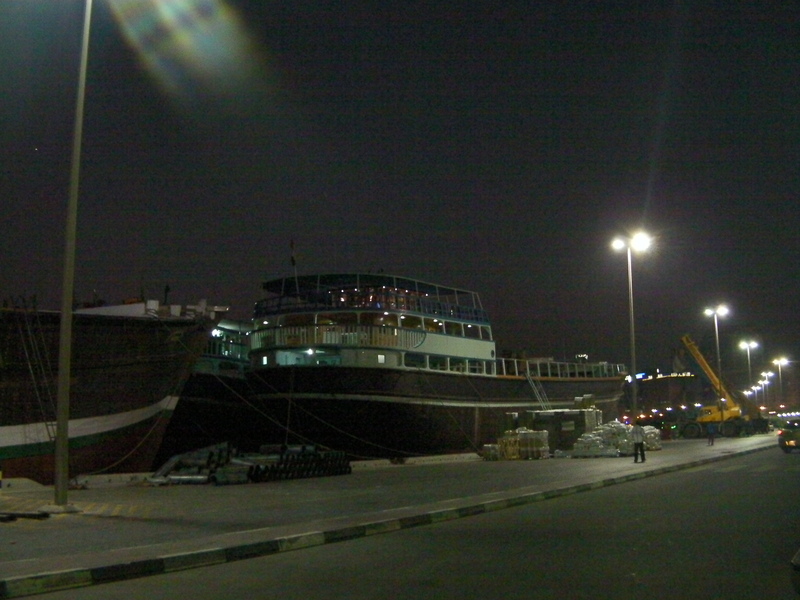 We took the bus down to Dubai Creek. 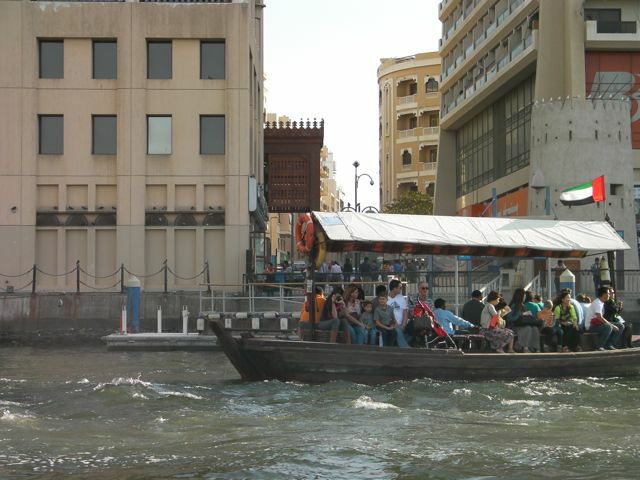 Then we took an abra (boat taxi) across the Creek. Video and additional photos will be posted on Sunday. Our home internet connection isn’t up to uploading videos. 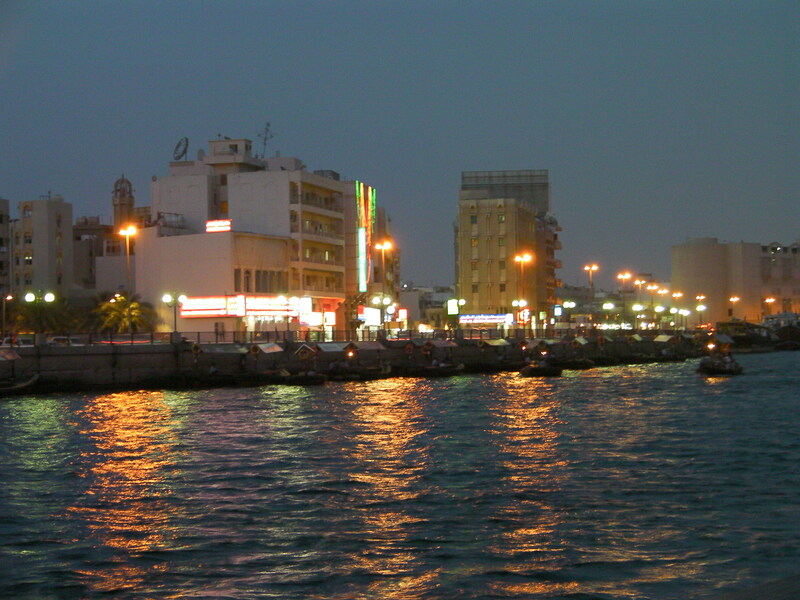 You are currently browsing the archives for the Dubai Creek category.